Naval Group performed a new launch of the F21 torpedo in the frame of the Artémis program led by the French Defence Procurement Agency (Direction Générale de l’Armement - DGA). In the medium term, the DGA aims to equip all the French Navy's submarines with this heavy torpedo, the most performant of its generation. This launch was performed early May from a nuclear-powered attack submarine (SSN). The F21 was launched under the authority of the DGA in a DGA Missiles Testing’s underwater acoustic range off the Hyères coast. "This new successful test from a nuclear submarine is part of the F21 qualification process and reinforces our confidence in the reliability of the torpedo, which was nevertheless subject to a particularly demanding operational test scenario", explains Damien Raby, director of Naval Group's Underwater Weapons Business Unit. The F21 used for the test was identical to the combat torpedo currently under production, of which several tens of units will be delivered to the French Navy as of 2019. The launch was performed in accordance with the procedure and the communication with the launcher was operational throughout the exercise. The data recorded in real time gave a full overview of the entire mission, thus validating the achievement of all objectives. 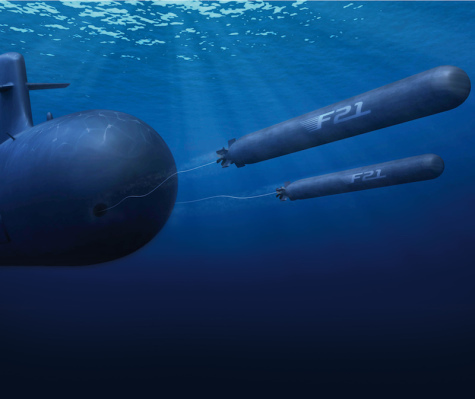 The objective of the F21 Torpedo program is to replace the F17 with a new generation, more agile, faster, smarter and more operational performance torpedo. The F21 heavy torpedo was designed to neutralize enemy ships and submarines. With an exceptional range and speed, the F21 torpedo is planned to evolve by sea bottom but also and especially in the very noisy and very dense coastal areas in maritime traffic. With a very high computing power that gives it exceptional real-time processing capabilities, the F21 torpedo benefits from an advanced mission system and increased autonomy. These technical features greatly broaden the possibilities of tactical employment with outstanding target discrimination ability especially in difficult environments. The contract includes the development and delivery of a hundred of F21 torpedoes as well as their integration on the French submarines. The Brazilian Navy has also selected the F21 to equip its submarines.